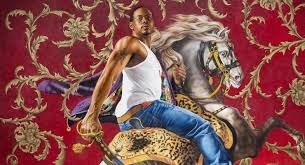 l'air de rien: Kehinde Wiley: Chinese master! Just what this poor world needs: another American artist who hires a crew of Chinese technicians to make sterile illustrations embedded in a syrup of Political-Correctedness... Sacré Bleu! Actually, it reminds me of the Salon of 19th century France, another epoch in art history when large insipid pictures became the more obvious means for inflating one's wealth and sense of culture of the Grand Bourgeoisie. (I am thinking of Bouguereau and Ingres, among so many others but at least they did most of their own painting) Ah.... a bad time for painting, it certainly is! Yale University seems to be the real culprit (among others) injecting an army of overly-intellectualized, and politically correct MFA's into a culturally-impoverished world, already suffering from too much mechanically unsound spin doctoring.